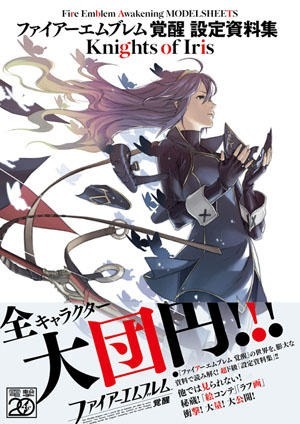 Prior to the shocking announcement at E3 that Fire Emblem: Awakening would indeed be localized, an art book was announced for the game that would be released by the end of this year named the Fire Emblem Awakening Material Collection: Knights of Iris. The art book illustrator is Yusuke Kozaki, who has worked on plenty of personal work, anime and comics and has done character art for the No More Heroes series, and of course the character art for Fire Emblem: Awakening. He recently shared on his twitter the illustration for the cover of the art book. The book will be filled to the brim with character art (full cover illustrations), event illustrations, NPC, unit and weapon designs. Also included are concept art of the game’s early planning development phase such as storyboards and rough sketches. That’s not all! It will also contain the character popularity poll results, full support conversation directory, and the Series 1 DLC character artwork collection; all of this jam-packed into 320 pages. No word on the localization of this particular piece of work, so we can only hope for now. The art book will be released in Japan on December 7 for 3,990 yen ($50). If you’re interested in importing, you can do so here via Play-Asia.com. The game was released in Japan earlier this year, while the game is expected to launch early next year for North America and Europe.